In aquatic food webs, global warming may affect higher trophic levels by increased surface water temperatures and by changing the biochemical composition of phytoplankton. Correlations have suggested that growth of Daphnia, a major consumer of phytoplankton in freshwaters, is limited by a low content of the polyunsaturated fatty acid eicosapentaenoic acid (EPA) in natural phytoplankton and thus by food quality. Here we used the EPA-free green alga Chlamydomonas klinobasis and Daphnia magna to test for such food quality effects. The alga was grown in continuous cultures at 15, 20, and 25°C and, different from other studies, dilution rates accounted for the effects of temperature on algal growth. This resulted in a maximum content of total fatty acids, of total PUFAs, of n-3 PUFAs and of α-linolenic acid when grown at 20°C, whereas at 15°C the lowest content of n-6 PUFAs and a threefold higher n-3/n-6 ratio than at 20 and 25°C were observed. Unexpectedly the PUFA content did not show a maximum at 15°C. Growth experiments with D. magna were performed at 15, 20, and 25°C. 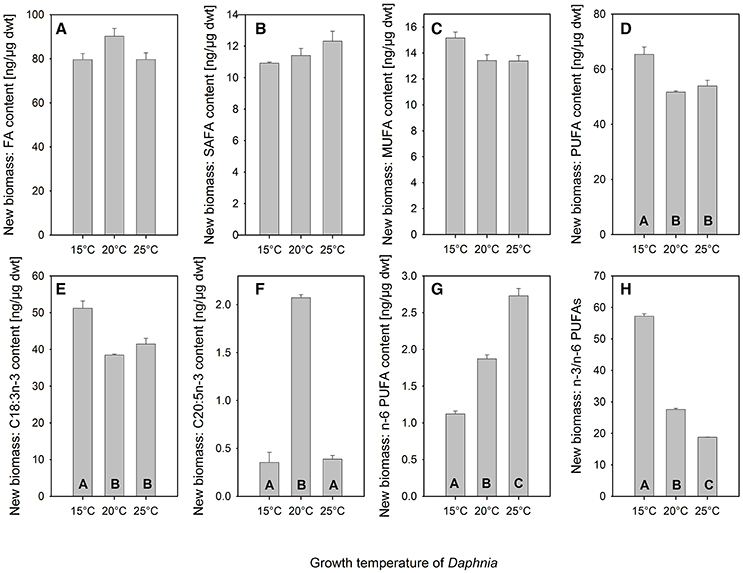 With C. klinobasis grown at 20°C, Daphnia somatic growth rates increased with temperature. When the alga was raised at the same temperature as Daphnia, somatic growth rates of Daphnia increased with temperature, and supplementation indicated EPA-limitation at 15°C only. At 15 and at 25°C, Daphnia growth was significantly higher on C. klinobasis raised at the respective temperature than on the same alga grown at 20°C. Hence, estimation of temperature effects on Daphnia growth requires to grow the food at the same temperature. At 15°C Daphnia newly built biomass had the highest content in total PUFAs and in α-linolenic acid, whereas the EPA-content was highest at 20°C. The content of n-6 PUFAs increased with temperature, which lead to the highest ratio of n-3/n-6 PUFAs at 15°C. This reflects increased PUFA-assimilation but decreased EPA-synthesis in Daphnia at lower temperatures. The results indicate that only if both algal food and consumer are grown at the same temperature, food quality effects of global warming can be more precisely predicted. During the past 50 years mean global temperatures have increased substantially, and a further increase by 0.4 to 4.8°C within the next 100 years is predicted (IPCC, 2014). This past global warming has affected species ranges and the response to seasonal events, as is reflected in timing of migration or flowering (Parmesan and Yohe, 2003; Bradshaw and Holzapfel, 2006). Attempts to predict the response of ecological communities to global warming have largely focused on the direct impact of changed temperature on their physiology (Pörtner and Farrell, 2008; Sinclair et al., 2016). However, communities are characterized by intra- and interspecific interactions, and it is increasingly acknowledged that the strength and dynamics of thermal responses of ecological interactions depends on the effects of temperature on the relevant traits of both individuals interacting (Gilbert et al., 2014; Pawar et al., 2015). The effects of temperature on consumer-resource interactions will largely depend on whether the relevant traits of both individuals will be affected asymmetrically or not (Dell et al., 2014) and may be regarded as the result of an interplay of direct physiological effects of temperature and indirect effects due to changing interactions between populations (Zhang et al., 2017). A consumer-resource interaction in freshwater foodwebs is the consumption of phytoplankton primary production by herbivorous zooplankton. Representatives of the genus Daphnia are major consumers of phytoplankton and thus contribute significantly to the trophic transfer of mass and energy of primary production to higher trophic levels (Tessier et al., 2000). However, the trophic transfer efficiency can vary widely, which can be attributed to variation in food quality of phytoplankton. The determinants of food quality may be of different nature, such as morphology, digestive resistance, toxicity, and nutritional inadequacy (Martin-Creuzburg and Von Elert, 2009b). Several correlative studies have shown that the prevalence of the polyunsaturated fatty acid (PUFA) eicosapentaenic acid (EPA, C20:5n-3) in natural phytoplankton predicted between 77 and 95% of the variance in Daphnia growth (Müller-Navarra, 1995; Müller-Navarra et al., 2000; Wacker and Von Elert, 2001). These evidences and the finding that the content of EPA and of other n-3 PUFAs in phytoplankton decreases with nutrient loading of lakes and ponds (Müller-Navarra et al., 2004; Persson et al., 2007) suggest that EPA-limitation of Daphnia may be widespread and be ongoing throughout the stratification period of lakes and ponds. Supplementation experiments have confirmed that growth and reproduction of Daphnia is limited by a low EPA content of its diet when growing on green algae (Von Elert, 2002; Becker and Boersma, 2005), and supplementation of natural phytoplankton has provided evidence that zooplankton populations are, at least temporarily, under bottom–up control due to PUFA limitation (Hartwich et al., 2012). This EPA-limitation may even affect predator-avoidance in Daphnia and such affect the strength of top-down control in zooplankton (Brzezinski and Von Elert, 2015). This limitation by EPA or other PUFAs is well explained by the fact that crustaceans, like all arthropods, are incapable of synthesizing long chain PUFAs de novo, and therefore require a dietary source of these lipids to satisfy their physiological demands (Harrison, 1990). Within the family of n-3 PUFAs or n-6 PUFAs, long chain PUFAs may be synthesized by elongation and desaturation of PUFAs with shorter carbon chain length (Weers et al., 1997; Von Elert, 2002). In arthropods the major fraction of PUFAs occurs in phospholipids, which are constituents of cell membranes, and furthermore PUFAs may serve as precursors of prostaglandins that are involved in arthropod reproduction (Harrison, 1990; Stanley, 2006). As being integral parts of cell membranes, PUFAs are involved in determining the fluidity of membranes in poikilotherms. In general, decreasing ambient temperatures reduce membrane fluidity, whereas increasing temperatures increase membrane fluidity (Hazel, 1995). When ambient temperatures are changing, poikilotherms try to adjust their membrane lipid composition such that they maintain membrane fluidity (homeoviscous adaptation) (Hazel and Williams, 1990; Hazel, 1995). From an evolutionary perspective this physiological homeoviscous adaptation must not be termed adaptation but rather reflects accomodation. It involves remodeling membrane lipids by modifying the chain length and the degree of unsaturation of fatty acids (Guschina and Harwood, 2006). The double bonds in PUFA lead to a more bent carbon chain, which increases the fluidity of PUFA-containing membranes. Thus, poikilothermes are expected to increase the PUFA-content in response to lower ambient temperatures (Farkas, 1979; Hazel, 1995). In line with the concept of homeoviscous adaptation, decreased ambient temperatures result in increased levels of EPA content in Daphnia (Schlechtriem et al., 2006; Sperfeld and Wacker, 2012), which suggests a higher sensitivity to EPA-limitation at lower temperatures. Supplementation with EPA-containing liposomes confirmed a higher degree of EPA-limitation of Daphnia when growing at 15°C compared to 20°C (Sperfeld and Wacker, 2012). Although both studies (Schlechtriem et al., 2006; Sperfeld and Wacker, 2012) provide clear evidence for an increased EPA-requirement at lower temperatures, neither study demonstrates that EPA-limitation of growth of Daphnia increases at lower temperatures: temperature was experimentally varied only for the growth of Daphnia, whereas in all Daphnia growth experiments the same algal food source, which was cultivated at a single temperature only, was used. Hence, from both studies (Schlechtriem et al., 2006; Sperfeld and Wacker, 2012) it cannot be predicted, how temperature changes that affect producer and consumer would affect the degree of EPA-limitation in Daphnia. The reason is that phytoplankton's fatty acid composition is as well affected by ambient temperatures. For green algae it has been shown that elevated temperatures lead to a decrease in the content of PUFAs (Fuschino et al., 2011; Sikora et al., 2014), which is further supported by a recent meta-analysis (Hixson and Arts, 2016). These findings suggest that lower ambient temperatures lead to a higher PUFA-content in phytoplankton, which might mitigate or even fully compensate the increased EPA-demand of Daphnia at lower temperature. However, the effects of global warming on EPA-limitation of Daphnia might be underestimated if at elevated temperatures the EPA-demand of Daphnia and the EPA-provision by phytoplankton decline at a different rate leading to an insufficient content of EPA in the algal diet. Here we accounted for these effects of temperature on the fatty acid profile of phytoplankton by growing a green alga in continuous cultures at 15, 20, and 25°C. We further took into account that temperature positively affects the maximum growth rates in phytoplankton (Goldman and Carpenter, 1974) and increased the growth rates of the continuous cultures of the green alga accordingly with temperature. We used these three different cultures of the same alga to perform growth experiments with Daphnia magna at 15, 20, and 25°C with and without the supplementation of EPA in order to simulate effects of global warming on the degree of EPA-limitation of Daphnia in a fixed phytoplankton-zooplankton assemblage. The green alga Chlamydomonas klinobasis (strain 56, culture collection of the Limnological Institute at the University of Konstanz, Germany) was grown in continuous cultures with a light intensity of 120 μmol m−2 s−1, which ran for 4–6 weeks. In continuous cultures, the dilution rate is equivalent to the growth rate of the culture. In pre-experiments with continuous cultures of C. klinobasis at 15°C, a maximum dilution rate of 0.13 d−1 had been determined. The maximum growth rate μmax of algae increases with temperature according to μmax = 5.35 × 109e−6472/T (Goldman and Carpenter, 1974). In order to account for this effect, continuous cultures were run with a dilution rate of 0.13 d−1 at 15°C, with 0.19 d−1 at 20°C and with a dilution rate of 0.28 d−1 at 25°C. Aliquots of these continuous cultures were filtered onto precombusted glass fiber filters for the determination of particulate carbon or for the analysis of fatty acids. Daphnia magna clone B originates from Grosser Binnensee (Lampert, 1991). D. magna stock cultures were maintained in 1 L of filtered (0.45-μm filter) and aged tap water, at 20°C under non-limiting food conditions of C. klinobasis. Daphnia growth experiments were performed at 15, 20, and 25°C and were initiated with neonates (< 18 h old) from the third clutch of the clonal mothers, which had been raised at the respective temperature. The growth experiments were carried out in 250 mL water containing 5 individuals of D. magna. The concentration of alga was 2 mg C L−1 in all treatments, and the animals were transferred daily into fresh food suspensions. The growth experiments were terminated when the experimental animals had deposited their first clutch to the brood pouch. At each temperature a single growth experiment was performed, which was terminated after 12 days (15°C), 6 days (20°C), and 4 days (25°C). All treatments within a growth experiment were terminated at the same time. The somatic growth rate (g) was calculated according to the formula: g = (ln Wt–ln W0) × t−1, where W0 is the initial dry mass of neonates, Wtis the mass of the individual at the end of experiment, and t is the duration of the experiment (Wacker and Von Elert, 2001). For the determination of the initial dry mass, subsamples of 10 individuals were used. At each temperature of the Daphnia growth experiment, three experimental treatments were performed, in which the animals were fed C. klinobasis grown in continuous cultures at the same temperature only, or with supplementation of either 60 μL control liposomes, or of 60 μL EPA-containing liposomes. In the growth experiments at 15 and 25°C, an additional treatment was performed, in which D. magna was grown on C. klinobasis grown in continuous culture at 20°C. Each treatment was carried out in triplicate. Liposomes and EPA-containing liposomes were prepared according to Sikora et al. (2016). Liposomes were prepared from 3 mg 1-palmitoyl-2-oleoyl-phosphatidylglycerol, and 7 mg 1-palmitoyl-2-oleoyl-phosphatidylcholine dissolved in dichloromethane. In case of EPA-containing liposomes, 3.33 mg EPA were added to this solution in dichloromethane. Then, the resulting solution was evaporated to dryness and suspended in 10 mL liposome buffer (20 mM Na2HPO4; 20 mM NaH2PO4; 150 mM NaCl,pH 7.0). Subsequently, the suspension was incubated on a rotary shaker (100 rpm) for 30 min and sonicated in an ultrasonic bath for 1 min. Then, suspensions were centrifuged (150,000 g, 90 min, 4°C), and afterwards, the supernatant was discarded, and the pellet was resuspended in 10 mL liposome buffer. Aliquots of this liposome suspension were stored at −20°C until use. Liposomes were always sonicated for 2 min before being used. Analyses were carried out with neonates (< 18 h old) borne at 15, 20, or 25°C and with animals at the end of the growth experiment. For fatty acid analysis, Daphnia lipids were extracted twice with 8 mL dichloromethane/methanol (2:1, v:v) with prior addition of nonadecanoic acid methyl ester (C19:0ME) and tricosanoic acid methyl ester (C23:0 ME) as internal standards. The pooled extract was evaporated to dryness under a gentle stream of nitrogen and then transesterified with 5 mL of 3 N methanolic HCl at 70°C for 20 min to yield fatty acid methyl esters (FAMEs). The time for transesterification had been checked to be sufficient for complete esterification and is in accordance with Schlechtriem et al. (2008). FAMEs were extracted with 3 × 2 mL iso-hexane, and the hexane phase was subsequently evaporated to dryness and dissolved in 40–200 μL isohexane, of which 1 μL was subjected to gas chromatographic analysis on an 6890-N GC System (Agilent Technologies, Waldbronn, Germany) equipped with a DB-225 capillary column (30 m, 0.25 mm i.d., 0.25 μm film thickness, J&W Scientific, Folsom, CA, USA). The GC conditions were as follows: injector and FID temperatures 200°C; initial oven temperature 60°C for 1 min, followed by a 120°C/min temperature ramp to 180°C, then a ramp of 50°C/min to 200°C followed by 10.5 min at 200°C, followed by ramp of 120°C/min to 220°C followed by 7.5 min at 220°C; helium with a flow rate of 1.5 mL/min was used as the carrier gas. FAMEs were identified by comparing retention times with those of the reference compounds, and then quantified using the internal standard and previously established calibration functions for each individual FAME (Von Elert, 2002). Fatty acid analyses were performed in triplicates, and absolute amounts were either normalized to Daphnia dry mass or to algal particulate organic carbon, which was determined using an NC Soil Analyzer Flash 2000 (Thermo Scientific, Germany). Treatment effects on Daphnia growth rates or on fatty acid content were investigated using one-way ANOVA with subsequent Tukey's HSD post-hoc tests. Data always met the assumption of homoscedasticity. These tests were performed with Statistica 6.0 (Stat. Soft. Inc., Tulsa, OK, USA). Dissimilarities in algal fatty acid composition were analyzed via cluster analysis based on Bray–Curtis similarities in PRIMER 7 (PRIMERE Ltd., Plymouth, UK) and plotted as non-metric multidimensional scaling (nMDS) plot (Figure 1). NMDS plots distances between samples corresponding to their ranked dissimilarities in a dimensionless ordination plot. Hence, axes have no scaling in a nMDS plot, but the stress value gives a measure of the degree to which the distance between samples in the plot corresponds with the actual multivariate distance between the samples. Lower stress values (< 0.2) are thus desireable. Figure 1. Non-metric multi-dimensional scaling (nMDS) plot of the green alga Chlamydomonas klinobasis grown in continuous cultures grown at 15°C (triangles), 20°C (circles) and 25°C (squares) showing compositional distinctness. The relative non-transformed percentages of saturated fatty acids, mono-, di-, tri-, and tetra-unsaturated fatty acids were considered as fatty acid groups. The green alga C. klinobasis was grown in continuous cultures at 15, 20, and 25°C at dilution rates of 0.13, 0.19, and 0.28 d−1, respectively. These different growth regimes resulted in differences in the algae's composition with respect to saturated, mono-, di-, tri-, and tetra-unsaturated fatty acids (Figure 1). The low stress value (0.01) indicates an excellent representation of the actual multivariate dissimilarities between the ordinated samples in the nMDS plot (Figure 1). More specifically, the content of total fatty acids was significantly higher if grown at 20°C (one-way ANOVA, F = 20.42, p < 0.005, Tukey's HSD, p < 0.01). The same pattern was observed for the total PUFA content (Figure 2A, one-way ANOVA, F = 25.59, p < 0.005, Tukey's HSD, p < 0.01). For α-linolenic acid (α-LA, C18:3n-3), which roughly made up 82–86% of the PUFAs of C. klinobasis across the experimental temperatures, the same pattern was observed with a maximum content of 72 μg/mg C, if grown at 20°C (Figure 2B, one-way ANOVA, F = 19.12, p < 0.005, Tukey's HSD, p < 0.05). In line with this, the content of n-3 PUFAs was highest if the algae were grown at 20°C (Figure 2C, one-way ANOVA, F = 24.86, p < 0.005, Tukey's HSD, p < 0.05). In contrast to this, the content of n-6 PUFAs (Figure 2D), was lowest if the alga was grown at 15°C (one-way ANOVA, F = 592.01, p < 0.0001, Tukey's HSD, p < 0.0005). As a consequence of this substantially lower content of n-6 PUFAs, the ratio of n-3 PUFAs to n-6 PUFAs at 15°C was almost threefold higher than at 20 and 25°C and decreased with temperature (Figure 2E, one-way ANOVA, F = 3153.06, p < 0.0001, Tukey's HSD, p < 0.0005; see also Supplementary Table 1). Figure 2. Mean (+ SE, n = 3) fatty acid content of the green alga Chlamydomonas klinobasis grown in continuous cultures at 15, 20, or 25°C. Depicted are the content (A) of polyunsaturated fatty acids (two and more double bonds, PUFA), (B) of C18:3n-3, (C) of n-3 PUFAs, (D) of n-6 PUFAs, and (E) the ratio of n-3 PUFAs to n-6 PUFAs. Different letters indicate significant differences between treatments (Tukey's HSD after one-way ANOVA). Note different scale. When D. magna was grown at 15°C on C. klinobasis that was cultured at the same temperature, juvenile Daphnia grew at 0.28 d−1. Significantly higher growth rates of 0.30 d−1 (one-way ANOVA, F = 5.23, p < 0.05; Tukey-HSD p < 0.05) were obtained by supplementation with EPA-containing liposomes, whereas control liposomes had no effect on growth rates (Figure 3, p = 0.87), which indicated EPA-limitation of Daphnia at 15°C. At 20°C D. magna grew with a rate of 0.50 d−1, and supplementation with EPA did not affect growth rates (Figure 3, one-way ANOVA, F = 2.73, p = 0.14). At 25°C a somatic growth rate of 0.75 d−1 was observed, which was not significantly affected by EPA-supplementation (Figure 3, one-way ANOVA, F = 2.73, p = 0.14). Figure 3. Mean (+SE, n = 3) juvenile somatic growth rates of D. magna grown at 15, 20, or 25°C. Daphnia was grown on the green alga Chlamydomonas klinobasis without supplementation (Chlamy) or with supplementation of liposomes (Chlamy + Lipos) or of EPA-containing liposomes (Chlamy+EPA-Lipos). C. klinobasis. was grown in continuous cultures at the same temperature as the temperature at which the respective Daphnia growth experiment was performed. Different letters indicate significant differences between treatments (Tukey's HSD after one-way ANOVA) run at the same temperature. Note different scale. When growth of D. magna on pure C. klinobasis, which was grown at the same temperature as the Daphnia, was compared across temperatures, growth rates increased with temperature (Figure 4, one-way ANOVA, F = 500.84, p < 0.0001, Tukey-HSD p < 0.005). At 15 and 25°C, Daphnia was not only grown on the green alga cultured at the same temperature, but as well on the green alga cultured at 20°C, and it turned out that at both temperatures growth was lower, when algal food had been cultured at 20°C (Figure 4, Tukey-HSD p < 0.005). Figure 4. Mean (+SE, n = 3) juvenile somatic growth rates of D. magna grown at 15, 20, or 25°C on C. klinobasis grown in continuous cultures at 15, 20, or 25°C. Different letters indicate significant differences between treatments (Tukey's HSD after one-way ANOVA). Daphnia growth rate increased with ambient temperature; when the alga was grown at the same temperature as Daphnia, it supported higher growth rates than C. klinobasis grown at 20°C. In order to assess the fatty acid content of newly built biomass of D. magna, we calculated the difference in fatty acid content between adult and newborn and divided this increase in fatty acid per animal by the increase in individual dry mass during the growth experiment. The content of total fatty acids, of saturated and of mono-unsaturated fatty acids of Daphnia was not affected by growth temperature (Figures 5A–C). However, the PUFA-content of newly built Daphnia biomass was significantly affected by temperature (Figure 5D, one-way ANOVA, F = 9.25, p < 0.05) with a PUFA-content of 65 ng/μg dry mass obtained at 15°C, which was significantly higher than PUFA-content obtained at 20 or 25°C (Figure 5D, Tukey-HSD p < 0.05). Similarly the content of α-LA (C18:3n-3) was affected by temperature (Figure 5E, one-way ANOVA, F = 12.93, p < 0.01) with a content of 51 ng/μg dry mass obtained at 15°C. This content was significantly higher than the α-LA content observed at 20 and 25°C (Figure 5E, Tukey-HSD p < 0.05). Since α-LA is the major n-3 PUFA in C. klinobasis, it is not surprising that the same pattern was observed for total n-3 PUFAs (data not shown, one-way ANOVA, F = 9.51, p < 0.05, Tukey-HSD p < 0.05). Figure 5. Mean (+ SE, n = 3) fatty acid content of newly built biomass of D. magna grown at 15, 20, or 25°C on the green alga Chlamydomonas klinobasis, which was grown at the same temperature as Daphnia respectively. Depicted are the content of (A) total fatty acids (FA), (B) saturated fatty acids (SAFA), (C) monounsaturated fatty acids (MUFA), (D) polyunsaturated fatty acids (two and more double bonds, PUFA), (E) C18:3n-3, (F) C20:5n-3, (G) n-6 PUFAs, and (H) the ratio of n-3 PUFAs to n-6 PUFAs. Different letters indicate significant differences between treatments (Tukey's HSD after one-way ANOVA). Note different scale. The content of eicosapentaenoic acid (EPA, C20:5n-3) was significantly affected by Daphnia growth temperatures as well (Figure 5F, one-way ANOVA, F = 84.61, p < 0.0001). An EPA-content of 2.1 ng/μg dry mass was observed when Daphnia was grown at 20°C, which was more than fivefold higher than the EPA-content of newly built biomass observed at 15 and 25°C (Figure 5F, Tukey-HSD p < 0.05). As well the content of total n-6 PUFAs was significantly affected by Daphnia growth temperatures (Figure 5G, one-way ANOVA, F = 154.03, p < 0.0001). However, for these PUFAs a different pattern was observed, as the content was lowest at 15°C and increased with temperature (Figure 5G, Tukey-HSD p < 0.005). Since the content of n-6 PUFAs increased with temperature and as the content of n-3 PUFAs was highest at 15°C, the ratio of n-3 PUFAs to n-6 PUFAs in Daphnia decreased significantly with temperature (Figure 5H, one-way ANOVA, F = 1032.13, p < 0.0001; Tukey-HSD p < 0.0005; see also Supplementary Table 2). Phytoplankton is producing almost half of the world's net primary production (Field et al., 1998), and it is a major provider of fatty acids (Guschina and Harwood, 2009). Strong correlative evidence and supplementation experiments strongly suggest that the content of polyunsaturated fatty acids (PUFAs) in phytoplankton determines the trophic transfer efficiency in freshwater food webs (Müller-Navarra, 2008). Within aquatic foodwebs, both, n-3 and n-6 PUFAs are provided almost exclusively by primary producers (i.e., phytoplankton, macrophytes). The PUFA content of algae varies considerably with taxon (Ahlgren et al., 1992) and, to a lesser degree, with growth conditions within species (Ahlgren and Hyenstrand, 2003; Guschina and Harwood, 2009). It is therefore not surprising that in freshwater systems the PUFA-content in natural phytoplankton fluctuates considerably with season due to changes in phytoplankton community composition and to fluctuations in type and degree of nutrient limitation in phytoplankton (Sommer et al., 1986; Müller-Navarra, 1995; Wacker and Von Elert, 2001). Global warming is predicted to lead to continuing increase in water temperatures (IPCC, 2014). Due to homeoviscous adaptation in phytoplankton, the PUFA content is expected to increase with decreasing temperatures, whereas increasing temperatures should lead to decreasing PUFA-levels and increasing content of saturated fatty acids (SAFAs) (Thompson et al., 1992; Renaud et al., 2002). However, temperature effects on fatty composition in general may differ with phytoplankton species (Thompson et al., 1992), and the results from meta-analyses are controversial, as Hixson and Arts (2016) report an increase of n-3 PUFAs with temperature, whereas, Galloway and Winder (2015) did not find a correlation of the long-chain PUFA content in phytoplankton with temperature. The effects of temperature are more consistent, if only studies on green alga are considered with increased temperatures causing a decrease in n-3 PUFAs (Renaud et al., 2002; Hodaifa et al., 2010; Fuschino et al., 2011; Sikora et al., 2014). Notwithstanding the above mentioned studies, we here report a hump-shaped relation between total PUFA-content and temperature, with an increase (instead of a decrease) of the PUFA-content from 15 to 20°C and, in accordance with other studies, a decrease of the PUFA-content from 20 to 25°C. Here, the growth rates of the green alga were strictly controlled (continuous cultures), and were experimentally elevated with temperature according to μmax = 5.35 × 109e−6472/T (Goldman and Carpenter, 1974). Previous studies had either harvested algal biomass in the late exponential (Renaud et al., 2002) or stationary phase (Hodaifa et al., 2010) or not provided information on algal growth stages (Sikora et al., 2014). This suggests that direct effects of temperature on algal growth rates have not been considered in these earlier studies. It is therefore reasonable to assume that the hump-shaped dependence of the content of PUFAs, n-3 PUFAs and of α-LA, which we report here, is due to the deliberate experimental increase of growth rate with temperature in our cultures. Interestingly, a similar hump-shaped relationship between the content of EPA and DHA in phytoplankton and temperature has been found in the meta-analyses by Hixson and Arts (2016) and, for the sum of EPA, ARA and DHA, by Galloway and Winder (2015). The decrease in PUFA content upon warming has been attributed to a reduced activity of desaturases with an increase of temperatures from 20 to 28°C in a green alga, probably due to thermal inactivation of the enzymes (Fuschino et al., 2011). If the temperature maximum of the desaturases in the strain of C. klinobasis used here would be between 20 and 25°C, this could explain the increase of PUFAs from 15 to 20°C due to increasing enzyme activity with temperature and a decrease from 20 to 25°C, due to thermal inactivation of the desaturates. In general, the hump-shaped response of the PUFA-content to growth temperature (Galloway and Winder, 2015; Hixson and Arts, 2016) reveals, that homeoviscous adaptation in algae does not rely on changes in fatty acid unsaturation only but that other mechanisms, e.g., fatty acid chain shortening or lipid-protein ratio changes (Guschina and Harwood, 2006) or changes in phytosterol content (Martin-Creuzburg and Von Elert, 2009a) may be involved. The ratio of n-3/n-6 PUFAs is affected by growth conditions (Ahlgren et al., 1992), and our finding, that the content of n-6 PUFAs in C. klinobasis increased with temperature is in agreement with the meta-analysis of Hixson and Arts (2016). As a result of the increase of the n-6 PUFA content with temperature, algae grown at 15°C show the highestest ratio of n-3 PUFAs/n-6 PUFAs, which, according to Taipale et al. (2015) is an indicator for elevated food quality. Both, n-3 and n-6 PUFAs are synthesized almost exclusively by primary producers (i.e., phytoplankton and macrophytes). Arthropods cannot synthesize PUFAs de novo (Harrison, 1990) and are thus dependent on a dietary supply of these essential compounds. However, within the family of n-3 PUFAs and n-6 PUFAs, elongation and desaturation of PUFAs is possible, although in several cases the rates have been shown to be too low to meet demands (Weers et al., 1997; Von Elert, 2002; Taipale et al., 2011). PUFAs are important for the physiology of invertebrates, as these fatty acids serve as precursors for hormones and components of cell membranes (Stanley, 2006). It is increasingly acknowledged that the response of ecological communities to global warming will largely depend on whether the relevant traits of interacting individuals will be affected asymmetrically or not (Dell et al., 2014; Pawar et al., 2015). With respect to interactions of primary producers and herbivores, it may be argued that effects of temperature will result in accelerated primary producer growth rate and therefore abundance, which will increase herbivore population growth rates. In case of the interaction of phytoplankton with Daphnia, this reasoning leads to the question, how effects of temperature on Daphnia somatic growth due to increased phytoplankton abundance in warmer environments can be disentangled from effects of changes in PUFA concentration per unit phytoplankton mass. However, in correlative studies, in which Daphnia growth on natural phytoplankton was related to the abundance of edible phytoplankton (measured as particulate organic carbon, POC) and the prevalence of EPA in natural phytoplankton, food abundance explained considerably less of the variance in Daphnia growth than the EPA-content: rPOC2 = 0.62, rEPA2 = 0.93 (Müller-Navarra, 1995); rPOC2 = 0.55, rEPA2 = 0.95 (Müller-Navarra et al., 2000); rPOC2 = 0.60; rEPA2 = 0.77 (Wacker and Von Elert, 2001), which suggests that Daphnia growth in nature is not limited by food quantity but rather by food quality except for nutrient-poor lakes (Persson et al., 2007; Müller-Navarra, 2008). The correlative finding that Daphnia abundance is most frequently not constrained by food quantity is mainly due to the fact that in lakes and ponds Daphnia serves as major food item for planktivorous fish and invertebrate predators, so that during most of the season Daphnia abundances do not reach carrying capacity (Sommer et al., 1986). In conclusion, since in nature Daphnia is, in most cases, not limited by food-quantity, a temperature effect on phytoplankton abundance would not affect growth of Daphnia. In line with the absence of food quantity limitation in nature, the experiments presented here have been performed at saturating food concentrations, i.e., 2 mg C L−1. With respect to global warming it is of interest to understand the effects of temperature on the EPA-content of Daphnia, since EPA-limitation of Daphnia in nature seems widespread. However, the results of correlative field studies are controversial: correlations over 3 years within a single lake revealed a decrease of EPA in Daphnia with temperature (McMeans et al., 2015), while a comparison of 13 warm and cold lakes yielded no correlation of Daphnia EPA content with water temperatures(Gladyshev et al., 2015). Experimental studies provide a more consistent picture on the effects of temperature on the EPA-content of Daphnia. When growing on an EPA-free diet, Daphnia have to synthesize EPA from the precursor α-LA (Weers et al., 1997; Von Elert, 2002; Taipale et al., 2011). On such a diet, the EPA content in Daphnia was higher at lower temperatures, when the alga was grown at a single temperature only (Schlechtriem et al., 2006; Sperfeld and Wacker, 2012). Here, we observed a hump-shaped pattern with an EPA maximum at 20°C, which resembled the pattern for the α-LA content in C. klinobasis and may be explained by the higher content of this precursor for EPA synthesis at 20°C. The higher α-LA content in Daphnia at 15°C indicates increased α-LA assimilation at 15°C compared to 20°C. Despite this higher α-LA tissue content, EPA synthesis is lower at 15°C as is evidenced by the lower EPA-content in Daphnia at 15 vs. 20°C. Altogether this indicates an increased PUFA assimilation (here mainly α-LA) of Daphnia at lower temperature and a reduced EPA synthesis at lower temperatures, which most probably is due to lower enzymatic activities of the involved elongases and/or desaturases (Hixson and Arts, 2016). Here we report that growth of Daphnia on green alga is EPA-limited at 15°C, but not at elevated temperatures (Figure 3). This confirms earlier studies in which the green alga had been grown at a single temperature and growth rate only (Sperfeld and Wacker, 2012), and it supports the main conclusion that EPA-limitation of Daphnia is more important at lower temperatures. 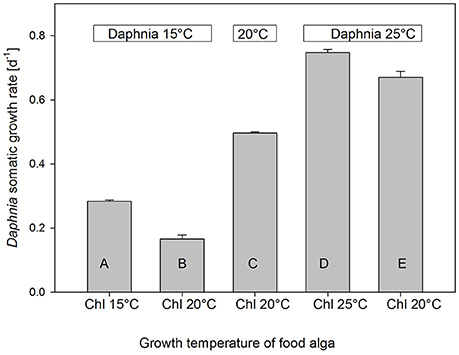 Nevertheless, growth of Daphnia at 15 and 25°C was significantly higher on the alga grown at the same temperature than on C. klinobasis grown at 20°C (Figure 4). This indicates that growing Daphnia at different temperatures but using a single food only would result in effects of temperature that differ from the ones obtained from the approach presented here. Hence, a more realistic estimation of temperature effects on herbivore-phytoplankton interactions requires to culture consumer and producer at the same temperature and to consider effects on the growth rate of the primary producers. However, these temperature effects on EPA content in Daphnia are of minor relevance with respect to homeoviscous adaptation, since in Daphnia EPA is generally rare and other PUFAs may have similar effects on membrane fluidity. In line with the concept of homeoviscous adaptation, we here report that Daphnia have a higher content of PUFAs and specifically of α-LA (the most abundant PUFA) at lower temperatures. This is in contrast to the findings of Schlechtriem et al. (2006), who used green algal food as well, but reported a relative decrease of PUFAs and α-LA in Daphnia at lower temperatures. This discrepancy may be attributed to the facts, that in Schlechtriem et al. (2006) a different green alga species (Ankistrodesmus falcatus) was used and it had only been grown at a single temperature (22°C). In accordance with Schlechtriem et al. (2006) and a the recent meta-analysis (Hixson and Arts, 2016), we here report an increase of the n-6 PUFA content with temperature, which resulted in a significant decrease of the n-3/n-6 PUFA ratio in Daphnia with rising temperatures. The experimental setup used here explicitly considered temperature effects on algal growth rates. This resulted in partly different effects of temperature on fatty acid content in the alga and on the content of EPA and PUFAs in Daphnia compared to earlier findings. This demonstrates that in addition to direct temperature effects, indirect effects via algal food quality should be considered as they propagate to the fatty acid composition of Daphnia. In conclusion our results are in accordance with the concept of homeoviscous adaptation and confirm that EPA-limitation occurs at 15°C but not at higher temperatures when growing on a green alga (Sperfeld and Wacker, 2012). Still, growth of Daphnia at 15 and 25°C was significantly better on the alga grown at the same temperature than on C. klinobasis grown at 20°C. This indicates that only if both algal food and consumer are grown at the same temperature, indirect effects of temperature on Daphnia are adequately considered, so that effects of global warming on foodwebs can be more precisely predicted. EvE conceived the study, performed the experiments and the sample analyses, PF performed the stastical analyses, and PF and EvE wrote the manuscript. This study was supported by the German Science Foundation, DFG, with a grant to EvE (EL 179/12-1). We thank Samraat Pawar, Serena Rasconi, and Christian Schlechtriem for their constructive feedback. Guschina, I. 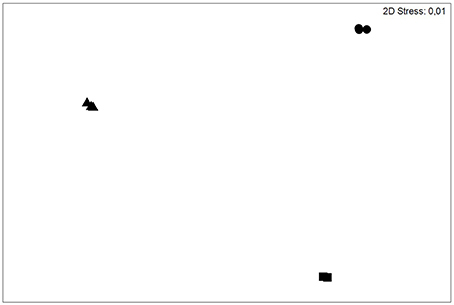 A., and Harwood, J. L. (2009). “Algal lipids and effect of environment on their biochemistry,” in Lipids in Aquatic Ecosystems, eds M. T. Arts, M. T. Brett, and M. J. Kainz (New York, NY: Springer), 1–24. Harrison, K. E. (1990). The role of nutrition in maturation, reproduction and embryonic development of decapod crustaceans: a review. J. Shellfish Res. 9, 1–28. IPCC (2014). “Climate change 2014: synthesis report,” in Contribution of Working Groups, I., II and III to the Fifth Assessment Report of the Intergovernmental Panel on Climate Change, eds R. K. Pachauri and L. A. Meyer (Geneva: IPCC), 151. Lampert, W. (1991). The dynamics of Daphnia in a shallow lake. Verhandlungen Int. Vereinigung theor. angewandte Limnol. 24, 795–798. Martin-Creuzburg, D., and Von Elert, E. (2009a). “Ecological significance of sterols in aquatic foodwebs,” in Lipids in Aquatic Ecosystems, eds M. T. Arts, M. Brett, and M. Kainz (New York, NY: Springer), 43–64. Müller-Navarra, D. C. (1995). Evidence that a highly unsaturated fatty acid limits Daphnia growth in nature. Arch. Hydrobiol. 132, 297–307. Copyright © 2018 von Elert and Fink. This is an open-access article distributed under the terms of the Creative Commons Attribution License (CC BY). The use, distribution or reproduction in other forums is permitted, provided the original author(s) and the copyright owner are credited and that the original publication in this journal is cited, in accordance with accepted academic practice. No use, distribution or reproduction is permitted which does not comply with these terms.